DWF - The Digital Watch Forum • View topic - Spaceman watches inspired from Space Oddysey and Star Wars? Spaceman watches inspired from Space Oddysey and Star Wars? ronaldheld wrote: no watches inspired by Star Trek? Since I've seen Kasper's Yema "Space Helmet" gold plated watch - cca 1976-1977, sporting a genuine Swiss ESA 9315 LCD module - a very expensive Yema watch at that time (about 1050 French Francs in 1976-1977 - please see the Yema advertising below), I knew that I want a similar one. I even have found after some search time , an Yema Space Helmet with a "regular" Fairchild module, that was only the chrome-plated variant, as one may see in the 1976-1977 Yema advertising below (cca 990 FF in 1976 ). Hope that You can see them now. Sorry, it was not my fault. Photobucket.com have suddenly choose to not let anymore the regular users to directly share their photos on third party websites/forums. Thus, many of my photos presented on this forum and other locations were suddenly not available! Anyway, I was prepared to migrate that photo collection to other photo-sharing sites. It has on the caseback of the watch a goldplated engraved copy of a famous image related to Space Exploration missions in early-mid 60's. 1. Which MAJOR Space Exploration event is presented in the engraved photo of this watch? - and this is the easy question! 2. 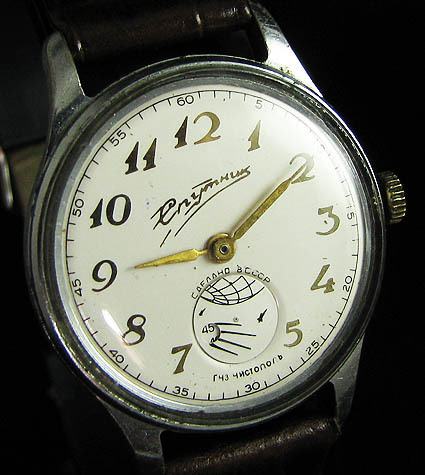 Which (otherwise quite old - at that time) Watch Company do you think that have produced this watch? 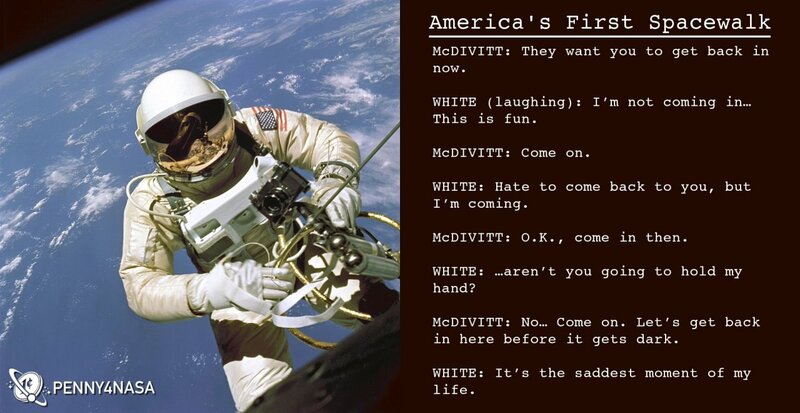 And also a funy moment of the first NASA/USA astronaut on a Space Walk (Edward H. White) - 1965, claiming that coming back from outer space was "the saddest moment of my life"
Nice case back! Is a lever movement or a pin pallet? This is really a very very good question! ...Nice sense of humor You have, hmmm...Master Yoda said! Contrary to what many watch collectors may have believed , Omega Was Not The First Watch In (outer) Space!!! So, prior to the Omega's Speedmaster official NASA designation (mentioned above), there have been other watches worn in space. Thus, despite the Omega being chosen by Schirra in 1962 in an inside module mission (n.r. pls read the above posts! ), the first watch to be worn in OUTER space/spacewalk was a STRELA, which is also known as a POLJOT brand or a Sekonda for export :)). It was worn on March 18, 1965, by Russian Cosmonaut Alexei Leonov - who became the first astronaut ever to make a space walk. The watch, a mechanical two register chrono with a 45-minute totalizer and a continuously running second hand would become the official watch of the Russian space program for almost 20 years. I will try to start here with the early history of the first watches RELATED/INSPIRED from REAL-LIFE Space Exploration's KEY moments. So this is EPISODE 1 - "The Revenge of the Communist Sith"
Thus, it is safe to say that the FIRST series of watches STRICTLY RELATED/INSPIRED from REAL-LIFE Space Exploration events, have appeared in USSR in late 50's-early 60's (so before Gagarin's Space Trip - 12 April 1961! 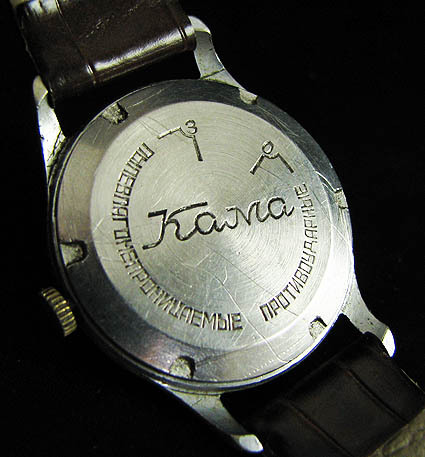 ), in the form of a series of watches made with a watch mechanism/movement "Pobeda/ZIM" K-26 - containing 15 jewels, balance without shock-proof performance and a dial with a side second hand, probably produced at the Second Moscow Watch Factory, Chistopol "ZIM" (please see the below photos). EPISODE 2 - "A New (Western) Hope"
3. March 18, 1965 -the Russian Cosmonaut Alexei Leonov - who became the first astronaut ever to make a space walk. Such outstanding successes have been celebrated AT THAT TIME in USSR in many ways, including some commemorative WATCHES - some of them may be seen in the posts above!!! 1. The President JFK's outstanding speech at Rice University on September 12th, 1962 - setting the goal of the space race during the 60's - THE MOON LANDING! Nevertheless, the Gemini 4 mission was only a pale consolation prize for NASA at that time, since Edward H. White was ONLY the SECOND Man in Outer Space, after the Russian Alexei Leonov. But, for sure, it was a MAJOR STEP forward to the later FIRST conquest of the MOON !!! Thus I was quite surprised when I have discovered the USA Ingraham watch celebrating this outstanding achievement, EVEN IF that event occurred 2 and a half month LATER than the Russian Space Walk!!! Anyway - based on the current knowledge - one may SAFELY say that this Ingraham watch is the FIRST Western made watch TO CELEBRATE A REAL AND MAJOR SPACE CONQUEST EVENT!!! How one may know the approx. production time of the watch??? 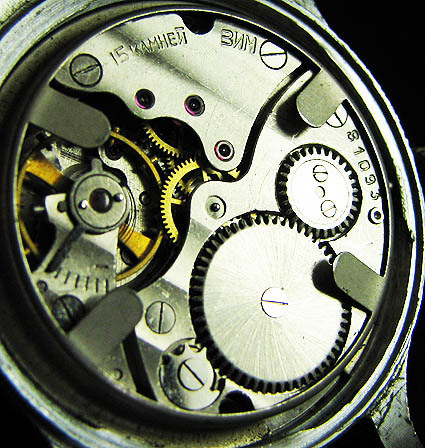 thus is quite safe to say that the watch may have been produced somewhere between MID 1965 to the late 1967 , probably in a limited amount, since I COULD NOT find another mention of it after a deep online search even on the web archives! Please let me know if You have any knowledge of the same OR a similar WESTERN made watch from any watch company in the mid 60's!!! Thanks in advance! 1. According to the MAJOR Doensen's book: "After the launching of the first space-vehicles, the owner of Catena Bulle Switzerland, Claude Lebet and the director Francis Bourquin ask André Le Marquand to create a range of watches of a totally new design. 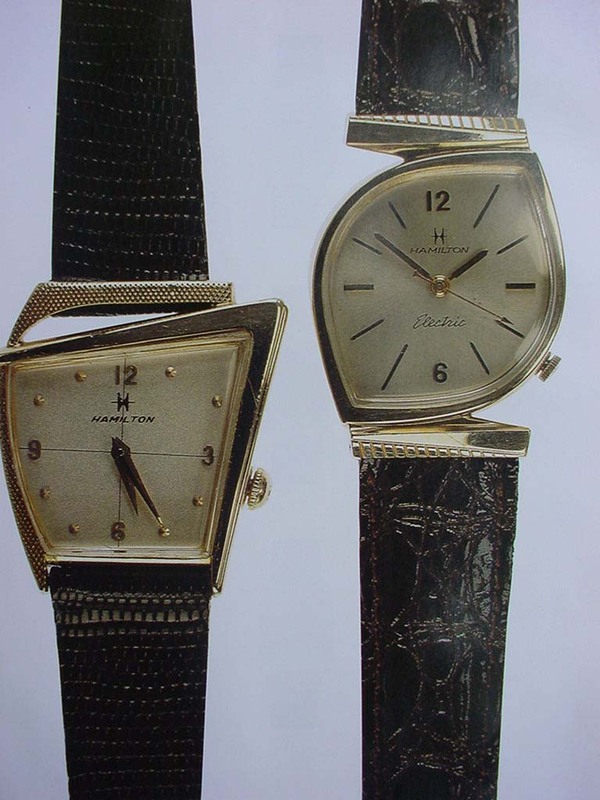 The result is an edition of four series of watches in 1972 and 1973, nearly all inspired by an astronaut's helmet. 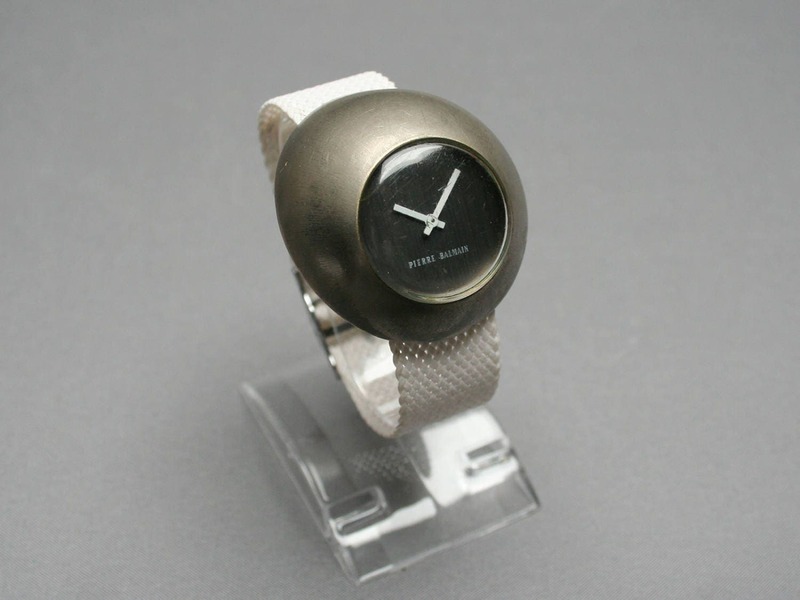 This watch is also sold by Tressa Lux, Fortis, Jules Jurgensen, Octo, Zeno Watch, Harlem and others. On December 11th 1969 the design is registered in the USA under no. 20.466 and a patent application is filed on February 10th 1970, in Switzerland." 3.BUT how about the IMAGE on the "plastic" caseback of the FIRST GENERATION Catena Spaceman watches (1972)??? "1972 - The Spaceman watches cause a sensation at the Basle Fair. Nobody thought these strange watches could ever be sold. Nevertheless, within ten years 150.000 Spacemans were sold all over the world. Especially in the Far East and in Hollywood, the watches were very successful. Many fake copies were made in Hong Kong." Can You see the similarities??? 1. The upper face of the FIRST Spaceman Watches (1972) was probably inspired from the “2001:A Space Odissey” movie - Premiere April 2, 1968, USA - (as I have already demonstrated at the beginning of this thread and in the image below)! 2. Even if the FIRST Spaceman watches have appeared and " cause a sensation at the Basle Fair" in 1972, on the caseback they have used images NOT FROM MORE RECENT (1969) MOON LANDING (!!!) BUT from the GEMINI 4 Space missions/the first SpaceWalk from an USA Astronaut in 1965!!! Because in "On December 11th 1969 the design is registered in the USA under no. 20.466 and a patent application is filed on February 10th 1970, in Switzerland. ", so they probably were not able to change "in time" the design with the new (copyrighted?) images from the moon landing!!! I almost cannot believe: IT SEEMS THAT I AM THE FIRST PERSON WHO HAVE NOTICED THE 1972 SPACEMAN WATCHES CASEBACK'S SIMILARITIES WITH THE 1965 GEMINI 4 MISSIONS IMAGES in the last 45 years!!! Here is one inspired by the movie “2001, A Space Odyssey”. Just finished restoring it including removing someones botched lume job (yellow and mouldy due to not letting it dry before encapsulating the movmemnt.) I chose a reddish lume for artistic sake and to set it off from other standard lumes. I wanted the lume to look like suns orbiting the centre. Note the intentional misspelling of Odyssee as Cybr noted. This was due to the movie title being patented with the correct spelling. I have a huge ugly Camy similar in shape but much larger: so ugly it is good Will post later when done. wow i'm impressed... perfect execution...a real beauty in every way Geoff. And Your outstanding watch is the FIRST (and more rare) variant made in 1969!!! "The first version from 1969 isn't shown in the catalogs but it's well known. 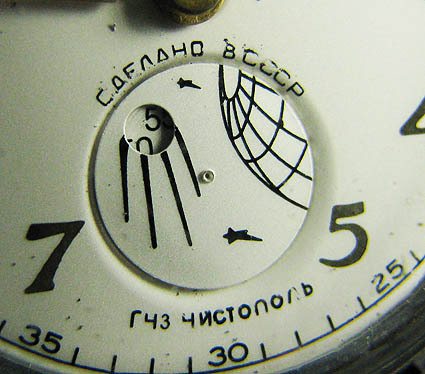 The dial has circular hour markers and bold triangular-shaped luminous hands. It came on a mesh bracelet that looks a little like chainmail. The second version was introduced in 1970 and produced through 1973. The dial was changed to rectangular hour markers and the hands became luminous stick hands. The bracelet was also changed to a link-style design." 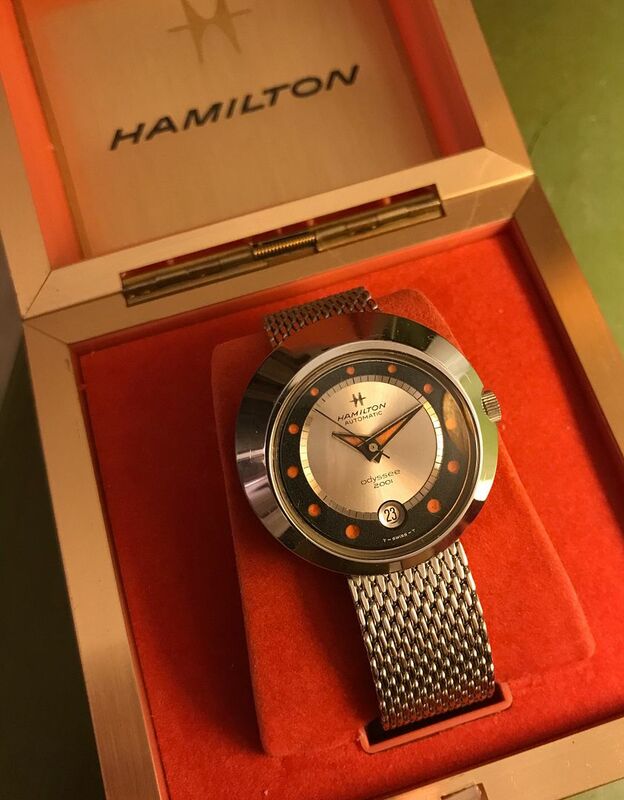 And BTW, the Hamilton Odyssee 2001 watch was NOT simply inspired by the Space Odyssey 2001 Movie: Hamilton has been chosen to made the "prop" watches used in the movie!!! "1966, Stanley Kubrick and Arthur C. Clarke commission a variety of companies to imagine & design futuristic products for the year 2001. Oh, yeah, and to be featured in the film, "2001 A Space Odyssey." Hamilton is hired and John Bergey creates a digital clock and analog/digital wristwatch (movie prop watch seen below). At the same time, it inspires his work inventing the Pulsar Time Computer LED digital watch in 1970. (entirely separate history, stay focused!)" Even more, Hamilton proposed 2 different Wristwatch designs: The well known one - and finally used in the movie - from John Bergey design and one from Richard Arbib - based on early design of Hamilton Electric, and "Stanley Kubrick chose the Bergey design over the Arbib." Last edited by cybr on 03 Mar 2018, 00:48, edited 1 time in total.